As an affiliate, Craftsy has given me the opportunity to review a class of my choice for free. (If you're jealous, you can become a Craftsy affiliate too.) I picked Angela Walter's Machine Quilting: Small Changes, Big Variety because I've enrolled in many of Angela's other Craftsy classes, and found them really useful. Actually, I have so many of them, it would have behoved me to buy the Free-Motion Quilting with Anglea Walters class collection. 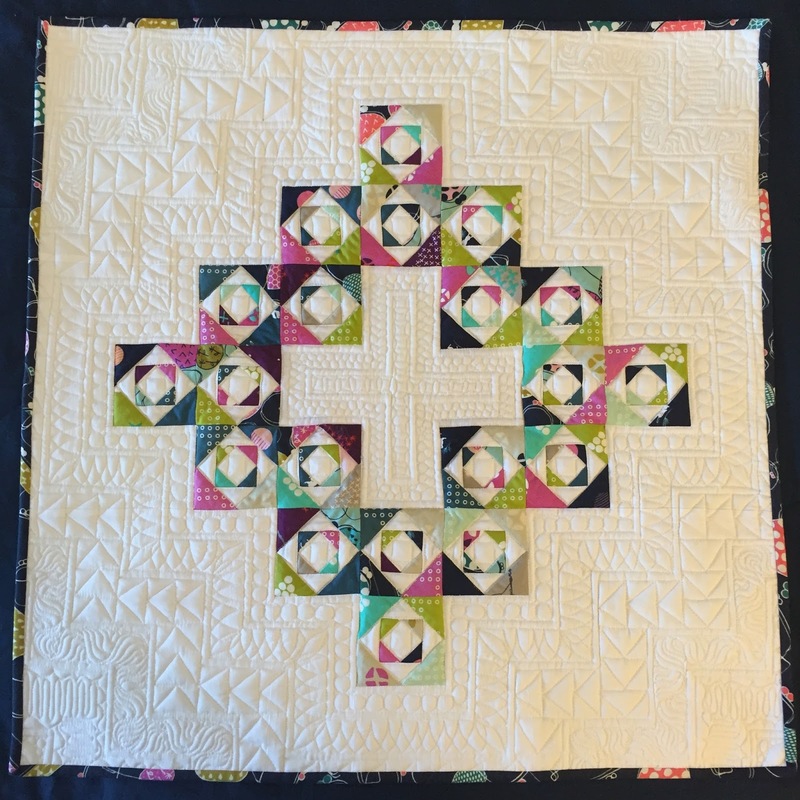 I thought this class would be good to review because it is suitable for those who are new to free-motion, but also provides some extra ideas for more experienced quilters. Like other Craftsy classes, this one included handouts (practice sketch sheets), a money-back guarantee, student and teacher feedback, the ability to make notations, and lifetime access. 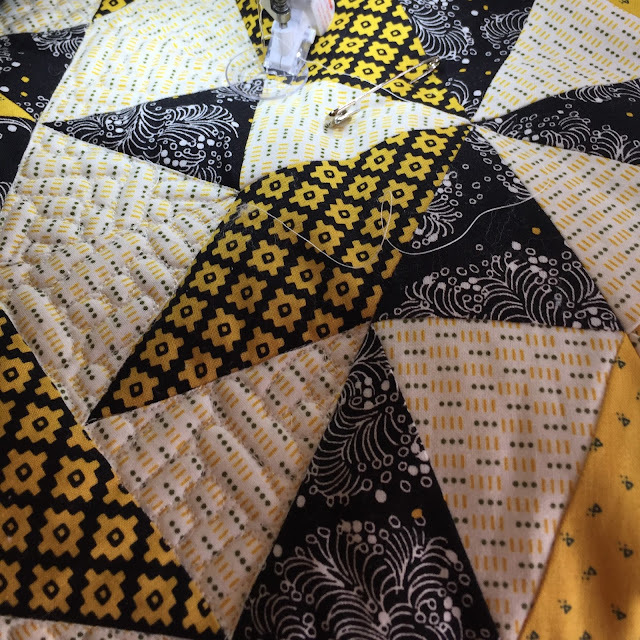 Specifically, this class covered the step-by-step process for creating a wide assortment of quilting designs: pebbles, swirls, ribbon candy, feathers, squares, and clamshells. Even better, Angela detailed how to create 4-6 variations of each for those who want to take it to another level. While watching the videos, I sketched them in my notebook. I like that I can also take my laptop or tablet into my sewing room, and use the 30 second repeat feature to show specific steps as many times as necessary, immediately prior to trying it out on the machine. While I was familiar with most the classic designs, I found it helpful to see the process. It's much more efficient to view the sequence of steps than to see a finished free-motion design, and guess how it is composed. I tried out a couple variations of pebbles, overlapping and changing shape, on actual quilts. I am happy with the results, and can't wait to try out some of the other designs. I heartily recommend this class as a great way to increase your quilting repertoire. After all, with the 31 designs explained within this course, you're bound to find something suitable for whatever quilt you're working on. As an added benefit, it's very affordable at the moment, just $19.99 due to a 56% off discount until April 1. 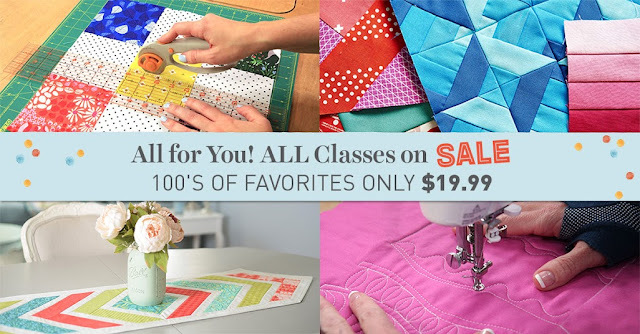 In fact, all Craftsy classes are $19.99 through the weekend. Have you taken a Craftsy class? Do you have a favorite? Today I present to you a long overdue quilt top finish. This one is for a local guild's Quilt Bank, which means it will be donated for a yet-to-be-determined charity fundraiser. It will be bundled with batting and handed off to a long-armer for quilting. 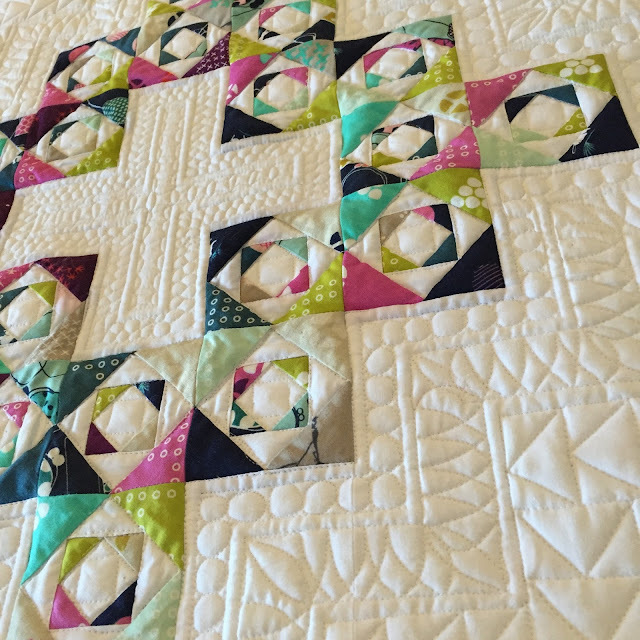 I created a pattern combining half square triangles and Four Patches, which you can pick up for free on Craftsy. 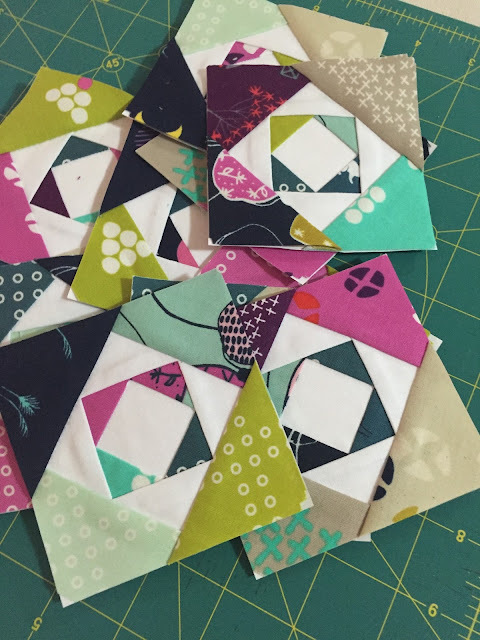 In the distant past, I was responsible for Quilt Bank, so I packaged the instructions for creating individual blocks along with enough precut fabric for a couple blocks. Guild members pieced the blocks, and I set them into the top. Unfortunately, this fabric collection is from way back when as well. It's A Walk in the Woods by Aneela Hoey for Moda. Well, that checks one thing off the extensive UFO list. Let's not discuss how the list continues to grow faster than it shrinks, okay? There's no place like the third quarter of the 1800's to find your inspiration for a modern quilt, amiright? Please pardon the snakiness, and hear me out. The Economy Patch Album Block captured my attention as I ambled amongst the Indigo Quilts exhibit at the International Quilt Festival in Houston. My eyes scanned its expansive negative space, minimalist fabric selection, miniature blocks composing a larger block, entralized plus element, and contrast of straight-line quilting with elaborate feathers. Then and there, the quilt was pinned on the Pinterest board of my mind. And because, (Who an I kidding?) I have a poor memory, I made a sketch on a little notepad scrounged from my diaper bag. Photographs were forbidden because a book featuring the quilts is available for purchase. However, if you want to see my muse, Google's got it covered. In retrospect, it seems like sacrilege that I didn't use Alison Glass Indigos. I think you'll forgive me though, given how pretty the Mochi line by Rashida Coleman-Hale from Cotton + Steel turned out. I made each paper-pieced Economy Block 3" in an effort to keep the overall size of the mini, well mini. I like to use flexible chopping mats from Dollar Tree and a wet-erase marker to try out quilting designs ahead of time. Then I marked out a few increments to attempt to keep the scale of my free-motion designs fairy consistent. I used an assortment of marking pens, with varying levels of success. I go into greater detail about this in the March Lessons Learned Linky post. My predominant approach to the quilting was creating frames that echoed the blocks, and filling them in with whatever struck my fancy. 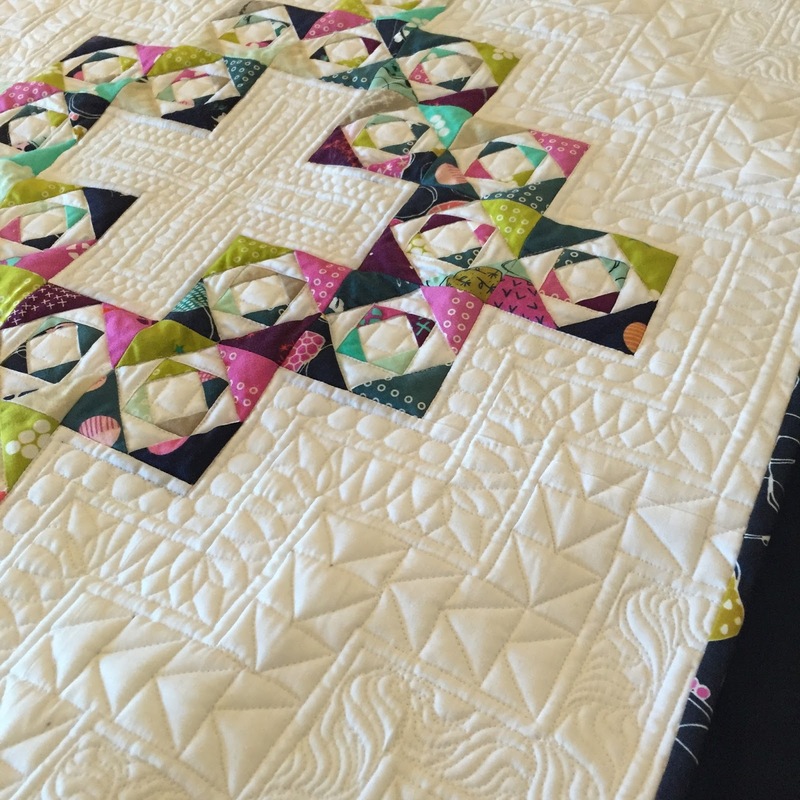 The motivating factor for creating this quilt (other than that making pretty quilt stuff is just my thing) was the Electric Quilt Company's February Contest sponsored by The Fat Quarter Shop. Mr. Random did not favor me, but that's fine because I still got to make a pretty quilt. Besides, there are ten remaining contests in case I want to tempt fate.